Selby M. - Trump J.
Trump J. 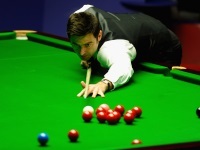 - Robertson J.
Brecel L. - Hamilton A.
Robertson N. - Milkins R.
Robertson J. - Hamilton A.
O'Brien F. - Liang W.